Nail Fungus Can Be Prevented! Onycholysis (loosening of the nail-plate) is the perfect environment for a fungal infection to start growing and turn into Onychomycosis, a fungal infection. Onychomycosis (Fungus) will continue to cause separation of the nail plate from the nail bed (Distal Subungual and Candida) and can be transferred to the other fingernails and the toenails. Nail Fungus usually starts when a loosening of the nail plate occurs. The loosening of the nail plate can happen by damage or trauma to the natural nail. Slamming nails in a door. Pulling nails backwards on car door handles. Picking off artificial nails instead of soaking them off. Using a drill on top of the naked natural nail, causing heat and friction. Any puncture to the Hyponychium. Wearing toenails too long and shoes too tight. Cleaning out from under nails with a metal implement. Fingernails too long for an active life style. Clipping toenails too short and cutting the Hyponychium. Loosening of the nail plate. A feeling like a little splinter is under the natural nail, but you cannot see it. The nails feel sensitive when picking up something or hitting them against something. The natural nails feels loose. The natural nail looks like the white free-edge is growing down the nail bed and the pink nail bed is getting shorter. Use Tammy Taylor Thymolize Everyday. 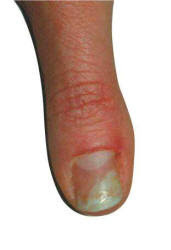 Onycholysis (loosening of the nail plate) is not a fungus but it is susceptible to fungus. We recommend scrubbing with Tammy Taylor Anti-Bacterial Soft Soak and a Tammy Taylor Plastic Manicure Brush. Then, follow with Tammy Taylor Thymolize underneath the free-edge, especially with artificial nails, at least once a day as prevention. So if there is Onycholysis, loosening of the nail plate, Tammy Taylor Thymolize should help prevent it from becoming Onychomycosis (Fungus). Fungus is not virus. Fungus is not a bacteria. Fungus is a fungus! If you do have a fungus, we recommend using Tammy Taylor Thymolize 3-5 times a day underneath the free-edge at the Hyponychium, every day, until the natural nail reattaches. The same goes for toenails. Note: Remove any artificial nail covering. If you do not see any improvement within 7 days, please see a physician. There are several physicians who recommend Tammy Taylor Thymolize.